As hard as I've tried, I'm not that person who strolls through a Goodwill store and happens upon the perfect solid wood vintage campaign dresser. Or that perfect condition Turkish wool rug. I need a little help when it comes to searching for the perfect vintage item. Enter the website Everything But The House. 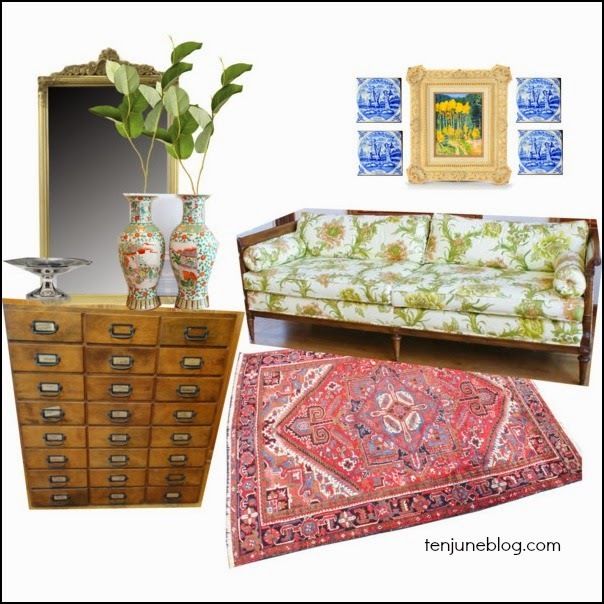 It's an online estate sale that helps sellers coordinate the sale of their vintage items- rugs, furniture, art, everything... well, everything, but the house. Bidders use the user-friendly website to shop and purchase their items. They've got items for sale from many different cities around the U.S., including two new sales coming up in Atlanta this week! Learn more about the Atlanta sale here. And y'all, the goods are awesome. Everything from the eclectic living room mood board above is sourced from Everything But the House. Totally amazing, I'm telling you. Look at that rug! If you want to sign up and shop this vintage fabulousness, head right here. Setting up a profile through this link will get you an automatic $20 applied to your shopping cart. And with items starting at $1 bids, $20 can get you pretty far. So. Let me recap. Check out the website here. Sign up here. Enter to win $75 to shop EBTH below! Thanks to Everything But the House for partnering up with me on this post. In full disclosure, I have spent hours on their website and fully endorse it's awesomeness! All opinions are my own. Too bad it is already $600 just to get it shipped to me! I'm obsessed with the wicker patio chairs from the Palm Spring sale! This white elephant garden planter - super charming! And the rugs. Oh the rugs. I really like the ITALIAN STYLE MIRROR. I love this upholstered chair! Love this site. Any of the desks. I love the card catalog. swoon!